Are you planning to create a WordPress blog in 2018 to start your blogging career? Honestly speaking, you can have your WordPress blog ready in less than 20 minutes. Blogging is one of the best ways to share your knowledge online and earn some decent money in return. Even in online business, every business marketer knows the importance of a blog for growing their business online. That’s because Blogging allows them to engage with their audience in a deeper level. With CMS (Content Management System) like WordPress, it has become extremely easy to start a blog without having any coding Knowledge. In this Beginner’s guide, I’m about to discuss complete step by step Beginner’s guide on how to create a WordPress blog without even paying a single penny to a Web developer. If you’re a Blogger users, and planning to move to WordPress, read this tutorial to migrate from blogger to WordPress. Here’s a list of things you’re going to learn in this Beginner’s tutorial about starting a blog in WordPress. 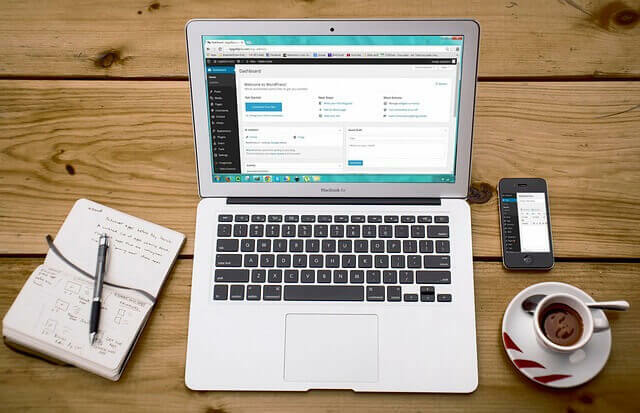 With the help of these 6 steps, you’ll be finally able to create your own WordPress blog. The most necessary thing you’ll need for making your first blog is an web hosting and a domain name for your blog. Let me break this for you! A domain name is the name of your blog or website, that people use to find your blog on the internet. Ex – google.com, facebook.com, twitter.com are the domain names for their respective website. You’ll have to choose a unique name for your domain. You can buy domain name with your hosting service. Once you have your domain name, you’re gonna need a hosting service ( I would recommend HostGator ) for your blog to get it live on the internet. Well, there are a lot of different hosting provider out there but I generally prefer HostGator mainly because their customer service is the best in the market. Their technical support is available 24/7 and responds to your query within an hour. Hosting Discount for a new blog: It will cost you around $3.95/month and you’ll get a 60% discount on hosting if you sign up to HostGator using this coupon code – howtoarticle60. HostGator has already hosted more than 9,000,000 domains and offers 99.9% uptime guarantee and 45-day money back guarantee (in case, you decide to withdraw from their service). If you have any kind of difficulty in purchasing the hosting and domain, you can contact me at [email protected] and I will do it for free. Go to HostGator homepage and click on ‘Get Started Now’. Here, you’ll have to select a hosting plan which starts from $3.95/month. HostGator offers 3 different plans – Hatchling, Baby, and Business. Hatchling plan is generally recommended for beginner’s who wants to host a single website (domain). On the other hand, Baby plan users can host multiple websites, while the Business plan is for the advanced user which comes with SSL certificates. Personally, I’ll advise you to go with Baby plan as it allows you to host multiple websites in future. Once you have decided your hosting package, click Sign up Now! button to move to the next step. Now, register a domain name for your WordPress blog. If the domain you want is not available you can use different URL extension such as .blog, .net, .org, .tech, etc. Note: Make sure to uncheck all the unnecessary add-ons, otherwise they will just increase the purchase cost. There are two coupon code for HostGator Hosting at an affordable cost. Use any of the code below while checkout. #1. howtoarticle1pennny – If you’re looking to buy hosting for 1 month, add this code. Your hosting cost will be $0.01. You’ll only have to pay for the domain. Note: This code will only be applicable if your billing cycle is 1 month]. #2. howtoarticle60 – If you are buying web hosting for more than 1 month, then use this code to get 60% instant discount. Once you have bought hosting and domain, you’ll then receive a Welcome email from HostGator in your mail inbox with the login details. After purchasing hosting for your blog, now, you’ll have to install WordPress on your domain name. Now, check your email from HostGator. Inside the mail, you’ll find the Control panel (cPanel) account login credentials. Simply, click on the cPanel link. Login to your cPanel account with the username and password provided in the email. Once you have logged into cPanel, you would see a page with lots of icons that may seem scary. Don’t be scared. You don’t need to worry about all these features yet. Just scroll down all the way down, where you’ll see “Software/Services” tab. Click on “Quick Install” or “Softaculous Apps Installer” whatever option you’ll see. On the next screen, you’ll see WordPress on the left side. Click on it to install WordPress on your domain. Select the domain (you just purchased) in which you want to install WordPress. Fill out other details such as email address, first name, last name, blog title, etc. It will also ask you to enter your blog destination URL (www.yourdomain.com, not www.yourdomain.com/blog). Always install WordPress at public_html as this is your root domain location. Leave ‘directory’ field blank if you want to install WordPress at the root of the directory. Click on ‘Install Now’ button. You’ll see a confirmation message and login details will be shown on the screen such as WordPress login URL, username, and password. Note them down. http://yourdomain.com/wp-admin. Visiting this URL will take you to WordPress dashboard area where you can customize your blog and start blogging. The next step in creating a WordPress blog is to install a cool design theme on your blog. There are thousands of free theme available on the WordPress dashboard that you can install on your newly created blog. If you desire to spend some bucks, go for the premium themes from ThemeForest, Envato, etc as they will make your blog look professional. If you are looking for best premium look themes that’ll cost you zero bucks, then you should sign up to MyThemeShop for a free membership account. 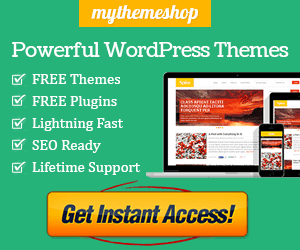 By registering to MyThemeShop, you’ll get some premium themes for free. The theme which I will recommend from MyThemeShop is Schema Lite which loads very fast. All their themes are fast, SEO optimized and mobile responsive. After logging into your WordPress admin area, click on Dashboard at the top menu. Now, go to Appearance > Themes. Click on Add New. Choose a theme from the list of available themes. Use the search box to find a suitable theme for your blog. Move your mouse to the theme and then click Install. 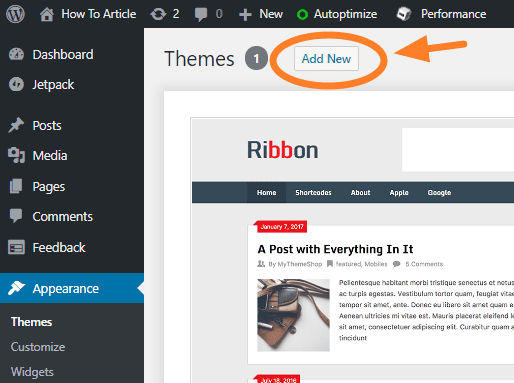 After installation is successful, click Activate link to activate the WordPress theme on your blog. You can learn about different ways to install WordPress theme by reading this tutorial. 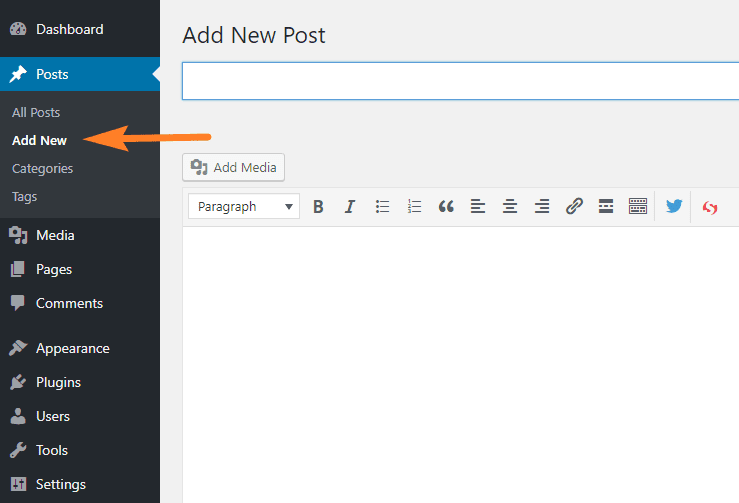 Now, its time to write your first blog post in WordPress. It’s time to create pages and add content to your blog. 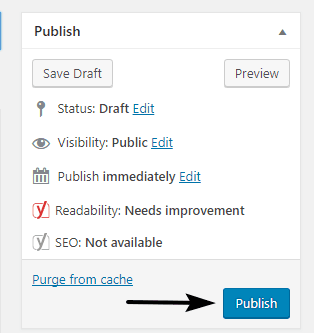 To create a new page/blog post, go to Pages > Add New ( Posts > Add New ) on your WordPress dashboard. You’ll see a post editor screen where you can write the content. Use the Publish button on the right side to publish your new page or post. One more thing – At the right sidebar, you’ll see Categories and Tags which are often known as taxonomies. In WordPress, they are like the table of contents of your blog. Understand them like this – if you’re writing a blog post about 7 ways to stay fit and healthy. You can use terms like Health tips, Fitness as your category. To get a deep understanding of Categories and Tags, read WP Beginner’s guide on Categories vs Tags. To further customize your WordPress blog, you’ll need plugins. In WordPress, plugins are used to add functionality to your site without manually changing the code. There are thousands of free plugins available in the WordPress plugin directory. Just don’t install too many plugins as they may slow down your website. Read this Beginners guide to learn how to install Plugins in WordPress. Once you have created a first WordPress blog, you would want to drive traffic to your blog and monetize it to make money. There are many ways to monetize your blog – Google Adsense is the best way to make money from a blog by placing ads on your website. Affiliate marketing is another great way to monetize your WordPress blog. To get traffic on your blog, make sure you are writing a compelling and out-of-the-box content. Figure out the niche and write quality blog posts around that niche. Make your post entertaining by using some high-quality images and beautifully designed infographics in your content. Social Media is one of the best ways to drive visitors to your blog. Optimize your blog for SEO to get ranked on SERP and drive traffic from search engines. Write quality content – When it comes to rank on Google SERP, Content is and will always be the king. Create quality content with more than 1000 words. A blog post with 1000 word will rank better than a blog post with 500 words. Keyword Research – Before writing a blog post, you should research about the keywords you are targetting. Use tools like Google Keyword Planner and SEMRush tool for keyword research. Using long-tail keywords 1-2 times semantically in your blog post drives the right type of organic traffic. Use keyword In Title – You should include your primary keyword in your blog title. Using an interesting title is important for SEO as it attracts the attention of visitors and generates more clicks from the search engine. Use headings properly – Google likes content that is well structured. Heading are important for the readability and SEO point of view. You should use heading in hierarchical order – using only one h1 tag(title) in any page and then h2-h6 tags as headings and sub-headings. Use Internal links – Internal links are the URL of your already written blog posts. Link back to other pages of your blog by using them as anchor texts. It helps search engine to find other pages on your blog. An internal link is a great way to reduce the bounce rate and keep visitors for more time on your website. Optimize images – Almost every blogger use images and infographics on their blog to improve the quality of content. You can SEO optimized your images by using meaningful title tags and alt tags. A title is the name of the image before uploading it. An ALT tag is the text that you assign to an image after upload. If the image fails to upload, alt text will be shown in place of an image. After successfully created a WordPress blog, the next thing you should do is to tell search engines about your blog. Adding your site to different webmaster tools such as Google search console, Bing webmaster tools, and Yandex is the first step in moving towards SEO. Learn how to submit your WordPress site to Google Webmaster tool and then submit an XML sitemap to Google. This concludes the WordPress guide here. I hope you now know how to make a WordPress blog. If you have any question or doubt, let me know in the comments below. What to do if your WordPress password is hacked? Join my Facebook page if you want to have a better interaction with HowToArticle.